In case you were wondering where I work…. 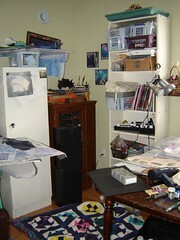 This is my studio, in its normal state of chaos. 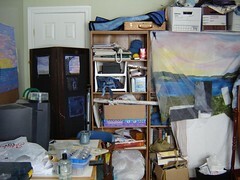 Chaos is a good thing; it means I’m getting lots done and my creative juices are burbling. 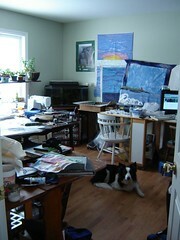 When my studio is clean, I’m probably in an artistic torpor or in some way ill. So here’s the view from the door, looking in. There’s usually at least one dog, sometimes three. In the far corner is a 40 gallon tankful of tropical fish. (Catfish, tetras and dwarf gourami, for those of you into such things. The lights are on a timer, which is why it’s so dark in the tank.) I have a window full of plants and the view is mostly east-facing, so I get lots of morning light. 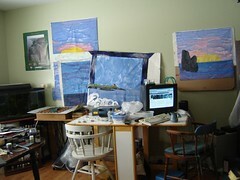 The computer, some workspace and some design boards occupy this side of the room. A wall of bookcases, covered by a flannel sheet is on your right as you enter. We’re planning on moving the books (and cases) out and puting in some storage shelving. the problem is that we have several thousand books and finding space for them elsewhere in the house is tricky…. The corner has a storage shelf and a cabinet. The cabinet is for light-sensitive things like fabric and things that toddlers shouldn’t use unsupervised, like glue and heat guns. And that’s my room. I love working on the main floor of the house as opposed to being in the basement; makes it easier to have Katherine around and get work done during the day. The only drawback is that my room has to be routed of toys (both human and canine) on a daily basis! Next Post The design wall today…. Thanks for letting us peer into your world! It is so full of life and light.